Colin George still works for Hastings Deering in Darwin where he was initially employed as an apprentice diesel plant mechanic when he won the apprentice of the year award in 1978. After 40 years with the company he currently holds the position of Learning Coordinator and is happy in his current role but will always be willing to look at other options in the company if something interesting comes along. When looking back over the years to his training, Colin remembers that the post-cyclone Darwin Community College had very few learning resources, such as modern engines and hydraulics, and even those were quite dated. The on-the-job training was really important because he was able to gain confidence and become competent by physically doing the job. This combination allowed him to continue to learn and move into other positions, such a field services for mining companies, which required him to show initiative in remote settings. Colin has gone on to complete Certificates IV in Training and Assessment, Safety and Frontline Management. In his current role he provides support and direct supervision for 14 apprentices at Hastings Deering and has previously had as many as 30 apprentices per year that he has mentored on-the-job and at trades school. Winning the award was an important recognition of his diligence as an apprentice and came as a bit of a surprise to Colin. Another highlight was being able to represent the Northern Territory in Melbourne at the national training awards and this included completing a course in public speaking and undertaking industry visits during the week-long stay. 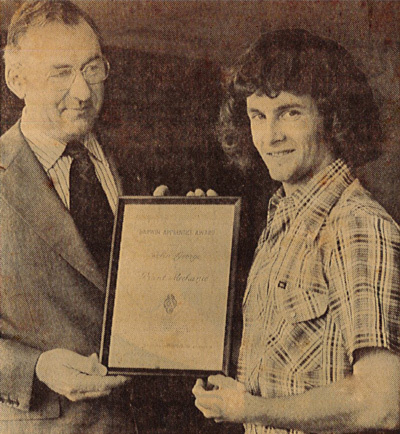 Colin exemplifies a long commitment to training at Hastings Deering with the earliest recorded Northern Territory apprenticeship award winner from the company presented with a prize from the Darwin RAOB Club in 1967. 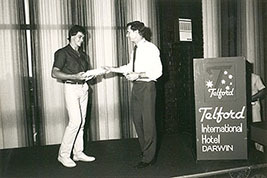 Tony Pearce was the apprentice of the year in 1983 when he gained his qualifications through the Darwin Community College as an electrical fitter mechanic working for Carrier Airconditioning during their final years in Darwin. He was then employed in the family electrical supply and sales business where he manufactured switchboards and control panels. Tony has gone on to become the Managing Director of his own business, Integrated Switchgear and Systems, which was established in 1987 and opened interstate offices in 1996. Tony recalls that the most useful aspect to his training was being in the work environment surrounded by high quality people that gave him the skills and confidence to work unsupervised in the final part of his apprenticeship as he had demonstrated his capacity to take responsibility. He was less enthusiastic about the endless hours of labouring at digging trenches and breaking through concrete, but in the end all of his training experiences provided him with a very good background at the end of the day. He commenced an Associate Diploma in Electrical Engineering, but found that it was not particularly relevant to the direction his business was heading. Tony is currently focused upon keeping his business operating in a tough commercial climate by sticking with their strengths in automation, oil and gas services, water management and power generation. The company currently has over a dozen apprentices and Tony has mentored hundreds of employees over the years. This has resulted in a long-serving core group of staff who started as apprentices with the company now occupying important senior positions in the business. In reflecting upon his high points of the awards process, Tony appreciated that senior officials and politicians would take the time to pay attention and offer congratulations to apprentices. The ceremonies were a big deal and generated a sense of excitement at having his hard work recognised and that all of his efforts were appreciated and acknowledged. Bronwyn Truscott is currently employed by the Children’s Services Support Program (Central Australia) in Alice Springs. She returned to study as a mature-aged student and completed her Association Diploma in Education at Centralian College while working in the children’s support program which provides for inclusive family support in the southern half of the Northern Territory. Her hard work and life experience were recognised when she won the award for vocational student of the year in 1995. In reflecting upon her training, Bronwyn recalls that learning the language of the sector was a constant challenge but that she had strong support from her lecturers who taught her how to study. She very much appreciated the face-to-face teaching and the practical and skills-based learning that was the cornerstone of the qualification. This was ideal for a person who had Year 10 as her highest level of study. She has since gone onto receive a diploma and bachelor degree in Children’s Services. She still retains a passion for her chosen field of early childhood education and coaches and mentors others to provide support for young people and their families. Bronwyn recalls that the honour and pride associated with receiving the training award stays with her today and recognises that ‘I did it’. Vocational education and training provided a person like her with minimal formal qualifications a way into an occupation that she is passionately committed to and hopes to continue working in for a long time. Jason Jones now holds the position of construction manager at Gwelo Developments in Darwin. He was heavily involved in the completion of the recently opened Elan SOHO building in Wood Street and is currently working on projects to redevelop the former Woolworth’s site in Knuckey Street and commercial and residential projects at Coolalinga. After completing his Certificate III Carpentry and Joinery in 1997 at the Northern Territory University, Jason has continued working with Gwelo although he did have several years working in the construction industry in Melbourne in order to gain extra experience and skills to bring back to the Northern Territory. 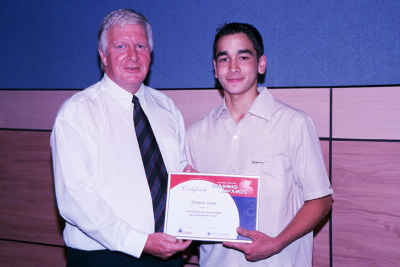 In addition to winning the local apprentice of the year award in 1997, Jason went on to win the Australian apprentice of the year award at the national ceremony. He believes that having formal qualifications is important for those involved in the construction industry and that all of his training proved to be useful at the end of the day. He has gone onto complete an Associate Diploma of Applied Science (Building Technology) and is also a Registered Builder. He has mentored many apprentices over the past two decades, many of which still work with the company. Jason believes that they should be exposed to the skills and knowledge that will allow them to ‘sit in my seat’ one day. His best memory from the entire awards process, apart for winning both locally and nationally, was the support he received from his employer as a sign of the faith they had in his abilities. Darren Johnson is currently serving as the local cyclone recovery coordinator at Galiwinku facilitating the rebuilding effort following the impact of the two cyclones in early 2015. His career began as an apprentice working for Wolpers and Flowers at MacArthur River Mines during which time he completed a Certificate III Electrotechnology (Electrical Fitting and Mechanics). His hard work was recognised when he won the Aboriginal and Torres Straits Islander award in 1998. He has held a number of other positions including working in the Northern Territory Public Service and for Group Training NT. Darren recalls that his training was very useful due to the combination of very supportive employers, on-the-job supervisors and fantastic lecturers at the Northern Territory University. He has maintained contact with many of those individuals over the years and still uses these links industry to produce more effective outcomes from his work. Darren has continued to study and has accumulated a range of certificates and diplomas including Business Frontline Management, Contract Management, Project Management as well as a Graduate Certificate in Public Sector Management. He intends to commence a degree in business that will support his movement up the promotion structure of the public sector. He has made time to mentor other apprentices/trainees and that was his major task when working at GTNT which he found to be a personally rewarding experience. Being recognised at the Northern Territory Training Awards was a special event for Darren and the highlight was meeting the other finalists who would go onto ‘raise the bar’ in their industry. Interacting with the others was highly motivational for Darren and it helped him to be self-reflective and to continue to work hard in both further study and at his job. Sally Odgers is based in Brisbane and is the property manager for all of the branch and office locations for the Commonwealth Bank of Australia in the northern half of Queensland. Her career started with completing a Certificate III Business Office Administration at Steve Strike Photographics in Alice Springs while studying at Centralian College. After completing her qualifications and winning the trainee of the year award in 2001, Sally moved into real estate sales and property management in the Territory before moving into bigger markets interstate. Sally recalls that her training in computer applications provided her with the skills and knowledge to operate successfully in a range of occupations. The on-the-job learning gave her a chance to undertake real work in conjunction with her study and that all of her learning has been shown to be useful. She has gone onto complete a Diploma of Property Real Estate and a Bachelor of Property degree. Sally has set herself the goal of being named property manager of the year and hopes to expand her areas of interest into shopping centre management and / or insurance assessing. She would also consider working to help people into housing by either working in the public sector or in defence housing. Mentoring others is part of Sally’s commitment to working with school students on careers days and she is a student ambassador for Central Queensland University. Sally recalls that the Northern Territory Training Awards were highly motivational and gave her greatly increased confidence when representing the Territory at the national awards. In particular, having the time to meet the other finalists in Darwin has resulted in friendships she retains today. They were each treated as people who were really special and this helped them realise that the awards were a ‘really big deal’. 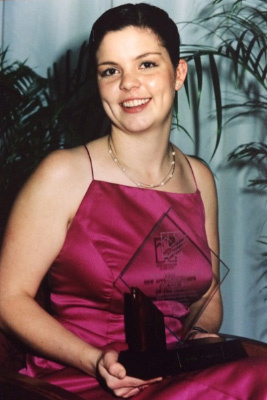 Camille Lew Fatt won the trainee of the year award in 2003 while both working and studying a Certificate III Business as well as a Certificate II Information Technology at the Northern Territory University. She went on to be employed at Charles Darwin University in administration and web design after completing her qualifications. Camille is currently employed in the Office of the Commissioner for Public Employment in Darwin as the Principal Advisor for Indigenous Employment and Career Development. She intends to remain with the public service and move up the corporate ladder. In reflecting upon her training, she found everything was useful as it helped get her career started and that she really appreciated learning on-the-job while gaining hands-on experience. Camille has since gone onto complete the Lookrukin Diploma of Frontline Management and a Bachelor of Commerce degree. Mentoring others is a major aspect of her current job as she has to be responsive to any Indigenous employee who requests assistance to improve their skills and knowledge. She also ensures that the Kigaruk and Lookrukin programs operate on alternate years to improve the formal qualifications held by Indigenous public servants. Camille enjoyed being able to explain her story as part of the awards process, but the absolute highlight was seeing the look of pride on her father’s face when she was announced as the winner. Dwayne Jones is currently working on a mining exploration drilling rig about 80 kilometres outside of Tennant Creek. 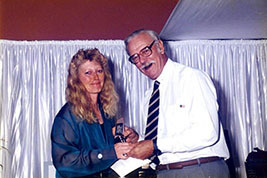 His formal training commenced when he undertook a school-based apprenticeship at the former Centralian College in Alice Springs and this lead to him winning the training award for this category in 2004 with his completion of the Certificate II Light Vehicle through Charles Darwin University and his on-the-job training was undertaken at Elston Auto Repairs. Dwayne found the training was very useful because it allowed him to start at a young age whilst still at school combined with being exposed to more experienced workers operating in the ‘real world of work’. He found this made the transition from school to full-time employment much easier and he was able to complete the Certificate III Light Vehicle based upon his positive experience of the flexible and supportive structure of the school-based apprenticeship. Dwayne has also branched out and opened his own business in Tennant Creek where he operates a waste bin supply and removal business. When employed in the automotive repair industry, Dwayne mentored other apprentices and work-experience students to help them share his positive experiences. The absolute highlight of the Northern Territory Training Awards for Dwayne was having his mother in Darwin at the presentation dinner to watch him receive the award as a public acknowledgement of the hard work he had put into gaining his formal qualifications while learning in the workplace. 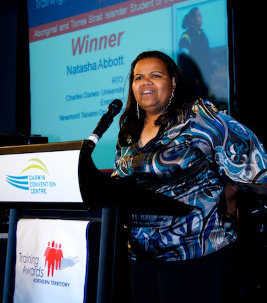 Natasha Abbott won the Aboriginal and Torres Straits Islander award in 2008 while studying for her Certificate III Business at Charles Darwin University in Alice Springs. She was employed by Newmont Mines in their Tanami Desert gold mine where she was involved with client management and upskilling computer skills for other employees. Since moving back to Alice Springs, Natasha has recently gone into a partnership and established a labour hire company, specialising in mining and environmental services. Natasha believes that all of her training was useful, particularly because it was flexibly delivered on her terms at the mine site. This was made possible because she had a supportive employer and a responsive trainer who even had to make light aircraft trips from Alice Springs to the Tanami Operations. Natasha has started studying a Certificate III Community Relations, but is mostly focused and happy to be establishing and growing her own business. She has always considered mentoring to be one of her strengths and has consistently assisted Indigenous employees and her family members through the application of her culture to help others. She also received the Gil Court Award for outstanding achievement in the resources sector in 2008. The Northern Territory Training Awards provided Natasha with the chance to meet others like her so that they could share their inspirational stories. The highlight of the entire process for Natasha was representing the Northern Territory at the national training awards as well as all of the support and preparatory activities that preceded that event. 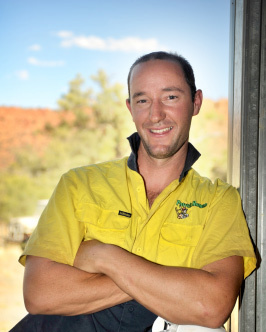 Ray Brown who is currently a site foreman with Patrick Homes in Alice Springs was recognised as the apprentice of the year in 2009. He completed his Certificate III Carpentry and Construction while studying at Charles Darwin University Alice Springs and undertaking on-the-job training with Patrick Homes. He is currently in the process of transitioning into a project management position to support new contracts won by the company and intends to complete a Certificate IV in project management. Ray found his on-the-job experience of building structures literally from the ground up to be the best part of his training because it gave him exposure to a diverse range of construction techniques and considerations that must be taken into account. Based upon these experiences Ray believes that a major part of his role is to mentor apprentices in training with the company and other less-experienced ‘tradies’ and he enjoys this aspect of his work. Ray found the trip to Darwin in the week prior to the Northern Territory Training Awards to be a highlight because it gave him the chance to meet the other finalists, hear their stories and appreciate the diverse range of skills required in modern workplaces. Jane Alia is currently working as a dental assistant for the Northern Territory Department of Health in Darwin. In 2012 she was recognised as the top school-based apprentice/trainee while attending Darwin High School and studying a Certificate III Dental Assistant qualification. Jane has described the huge effort that was required to balance school and on-the-job training but that it was all worthwhile because she was able to get hands on experience in a field she really loves while completing her formal studies. Jane is currently studying for a Bachelor of Nursing degree at Charles Darwin University and hopes keep working in oral health and eventually become a dentist. In the meantime, she provides mentoring and support to trainees who come to the clinic and encourages current school-based apprentices to complete their studies when they are on-the-job. Her best memories of the Training Awards included winning (of course!) and going on to represent the Territory at the national training awards. Jane found that the entire awards process allowed her to meet many other inspirational nominees and finalists whose stories were highly motivational and that gave her even more encouragement to do well in her chosen occupation. 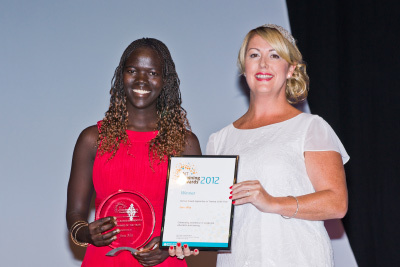 Louise Galey became the trainee of the year in 2013 as a result of studying for her Certificate IV Population Health at Charles Darwin University. She was working for the Department of Health and employed through GTNT during this time. She is currently working as the release of information officer at Royal Darwin Hospital following her return to Darwin after running a suicide prevention program in Tennant Creek. Louise plans to get back into population health and undertake further study by completing the Certificate IV Frontline Management. She found all aspects of her training to be useful and particularly valued the on-the-job learning where she had the chance to work with a range of people with industry knowledge and long experience in population health. Mentoring of other participants in the Northern Territory Training Awards has been a priority for Louise and she continues to participate in the finalists’ weekend retreat to help them become good ambassadors for vocational education and training. Louise enjoyed every aspect of the training awards process. The chance to meet the others at the finalists’ weekend and hear their stories broadened her knowledge of the Northern Territory and the wide variety of occupations that are operating here. Knowing each other as a result of the weekend retreat was also a large advantage when it came to representing the Northern Territory at the national training awards because everyone supported everyone else. 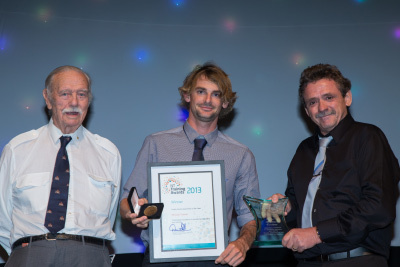 Michael Treloar was the apprentice of the year in 2013 as a result of his undertaking a Certificate III Plumbing through Charles Darwin University while employed at Fred NT where he still works. He believes that the ability to apply his knowledge and skills was greatly enhanced by undertaking such a large amount of on-the-job learning while working out bush where forward planning and creative solutions to problems were required because it was not possible to ‘pop back to the shop’. He is concerned high standards for the industry are maintained and that every apprentice needs to be competent in all areas of their training. Michael plans to stay with Fred NT and take on more responsible positions in the company. He is currently, with the support of his employer, studying for his pilot’s licence so that he can use the company aircraft to undertake work at remote locations in a timely manner. He mentors a range of other employees including apprentices and overseas-trained ‘tradies’ that are working for the company.